I made this for Christmas Day because, pretend as we do, nobody in this family really likes Christmas pudding. There’s no point persevering with the lie anymore, so we did something different, and it was a vast improvement on the traditional bowl of stodge. This is our new Christmas pudding. The absence of flour makes this particular cake light, but richer than normal, as if the chocolate flavours become more concentrated because of the lack of flour to dilute them. A splash of very strong coffee draws out and bolsters the cocoa taste even further … this is the sort of cake that you’d naturally eat alongside a good cup of coffee, so why not add a little to square the circle? The body of the cake is made from ground hazelnuts. You’ll be lucky to get skinned hazelnuts in the shops, and you don’t need or want the skins in this cake, so do the skinning yourself, you must. Methods for doing this litter the Internet, but only one of them works – cover the hazelnuts in water in a pan, and add a couple of tablespoons of bicarbonate of soda. Bring to the boil and simmer for three minutes before draining … the skins will just slip off the nuts very easily. It’s a little laborious, but it works. If you can’t stand the hassle, try ground almonds instead. Weigh out 200g of light brown soft sugar, and add one tablespoon of this to a food processor along with 125g of skinned hazelnuts, and grind the lot to a fine texture. Break 200g of the best quality plain, dark chocolate that you can afford into a glass bowl, and add 200g of butter and a teaspoon of vanilla extract. Place the bowl over a pan of barely simmering water bain marie style and let the butter and chocolate melt together until smooth. Crack five eggs into a large bowl, add the rest of the sugar and whisk constantly for five minutes until they’re rich and thick, and about doubled in volume. Don’t be tempted to try to do this by hand – you’ll never get there. Electric whisks only, please. Now to mix things together. The real trick here is to keep as much air as possible in the eggs, so gently pour the melted chocolate around the edge of the bowl with the whisked eggs in it, to avoid over-deflation, and gently fold the chocolate in with a metal spoon, until the mixture is a uniform colour and smooth. Next, add the ground nuts and a pinch of salt and fold them in the same way, before tipping the cake mixture into a lined and greased cake tin of 23cm in diameter. Bake for thirty-five minutes in a 180c oven, until the cake only just wobbles in the very centre. 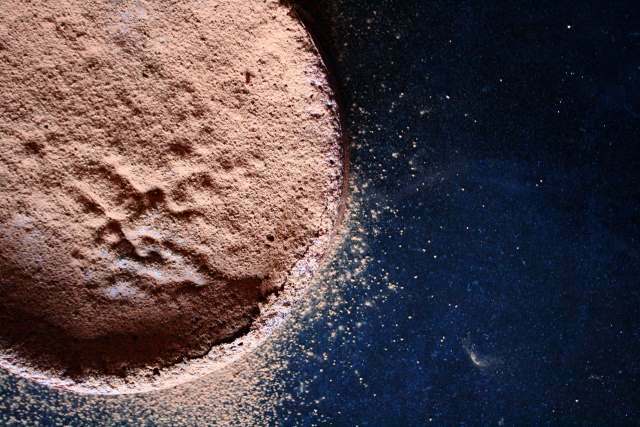 Allow to cool, remove from the tin, and then dust extravagantly with cocoa powder. There won’t be much left for Boxing Day.